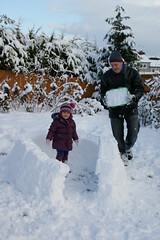 Daddy's been building a big igloo all day for me and Léon and Charlotte to sit in. He used a plastic box to make snow bricks. Afterwards it was big enough for us all to sit in. Daddy put the picnic rug inside for us. Poor Amaia is sick so she had to watch from inside the bedroom.